1- In-Kyung Kim - At the start of the 2017 season, many questioned I.K. 's motivation. Her pattern throughout most of the 2016 campaign was to play a couple of weeks and then take off a couple. She played in just 17 of 33 official tournaments. She was still playing quality golf, but her better days seemed to be behind her. This season she still only played in 17 events, but the results have been quite spectacular. Who would have thought that only two players would win 3 times on the LPGA tour, and she would be one of them? Nobody! 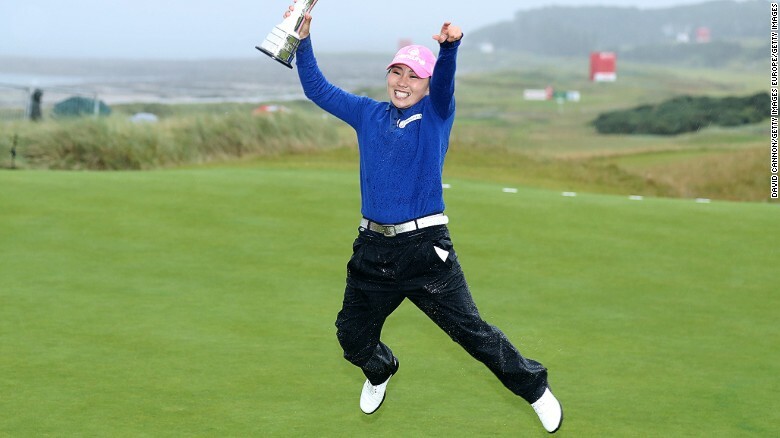 To top it off, her third victory was at the Ricoh Women's British Open. That win was her first major championship and we could finally forget that missed 16 inch putt that cost her the Kraft Nabisco Championship in 2012. She rose this year all the way to #12 on the year's money list despite taking half the season off. 2- Cristie Kerr - Cristie had a mediocre year in 2016. She has reduced her schedule this year (sitting out 10 events), and that has certainly worked in her favor. She not only has won twice this year, but her 8 top five finishes are just one behind the league leaders. She finished #39 on the money list in 2016, and all the way up to #7 this year. She now has 22 of the 27 points needed for induction in the LPGA Hall of Fame. 3- Moriya Jutanugarn - While all the attention was being paid to her younger sister (Ariya), she had one heck of a year. I know she is still chasing that first LPGA win, but we all know it is coming soon. Moriya had 6 top five finishes, 11 top tens, and led the tour with 22 top twenty-fives. She only missed one cut the entire season. She moved up from #40 (last year) to #9 on the money list. 4- Danielle Kang - A two time amateur champion, superstar was written all over her from day one. She teased us from time to time with some stellar play, but she came into this year as an underachiever. This year has changed all that. She made her first win a major championship by winning the KPMG Women's PGA Championship. She had four top five finishes, and has improved her money list standing from #36 in 2016 to #17 this year. 5- Michelle Wie - Last year was a disaster for Michelle, as she finished #105 on the year's money list. She has turned it all around this year. Michelle posted 6 top five finishes and eight top tens. Last year she finished #105 on the money list, this year she jumps way up to #19. 6- Marina Alex - A marginal player the first few years of her career, Marina has become one of the most improved players on tour. She finished the season with 2 top five finishes, 6 top tens, and a healthy 15 top twenty-fives. She moved all the way up from last year's #66 finish on the money list, to #27 this year. 7- Sung Hyun Park - I put her this far down my list only because many people in the know will say this is not a surprise. Yes I know she won 7 times on the KLPGA tour last year. Success on other tours doesn't always translate into success on the LPGA. I guess we can all say she was successful beyond our wildest expectations, as she shared the Player of the Year honors with So Yeon Ryu. Oh yes, she also won the 2017 official money title. Honorable Mentions: Brittany Altomare, Sarah Jane Smith, Jeong Eun Lee, Angel Yin, Nelly Korda, and Madelene Sagstrom. Lydia Ko was the year's biggest disappointment. 1- Lydia Ko - It is very unusual that the year's biggest disappointment would have 11 top ten finishes, but our expectations for Lydia are so much higher than that. Lydia had 4 victories in 2016, but failed to win a single tournament in 2017. Last year she was #2 on the year end money list, this year she finished #13. She started the year at #1 in the Rolex Rankings and has fallen all the way down to #9. 2- Brittany Lang - Last year's U.S. Women's Open champion just never got on track in 2017. In 25 starts she has managed just 1 top ten finish. Last year she finished #9 on the money list, this year she fell to #69. 3- Hee-Young Park - Not much you can say about her year except that it was a complete disaster! In 22 starts this year she managed only a single top 10 finish. The only reason she is retaining her full time playing privileges for the 2018 season, was that she finished 3rd in her next to last tournament of the season. That was a third place finish at the MCKAYSON New Zealand Women's Open. The field rating for that tournament (just 22%), was the weakest in the 8 year history that I have been rating playing fields. That said, this very popular player will get another chance to show she has something left in the tank in the upcoming 2018 season. She dropped this year from #34 to #91 on the year end money list. 4- Candie Kung - Always a consistent performer in the past, that was not the case this year. In 28 starts this year she only had 1 top ten finish. Last year she finished #25 on the year end money list, this year she fell to #55. 5- Na Yeon Choi - Some will say that this is not a major surprise as we saw this coming the second half of last year. What is a surprise is that she had just 2 top twenty-five finishes in 20 starts. She also missed the cut 11 times. Her down year in 2016 still produced a year #55 on the money list. This year she finished #135! 6- Haru Nomura - Although she did have an early season win, she managed just 1 other top ten finish all year. In fact, in her last 13 starts she failed to produce a single top 20 finish. She fell from #11 last year to #35 on this year's money list. 7- Alison Lee - It was a big step backwards for "Ali" in 2017. In fact, in 22 starts she didn't have a single top 15 finish. In 2016 she finished #38 on the money list, this year she fell all the way down to #86.